Birmingham News: "Pine's duets with concertmaster Daniel Szasz and principal cellist Warren Samples were lovingly played, Fairouz extending the soloist's expressive range into an ecstatic realm." Richmond Times-Dispatch: "No electronica aboard for this trip back in time; rather, a clear and committed acoustic performance from Myers[sic], who navigated even the most abstruse passagework with grace." The Guardian: "Kopatchinskaja's inimitable range of tonal colours and dynamics came to the fore in both, boldly emulated by the ensemble's string players." The New York Times: "…throughout the program, Mr. Pace demonstrated a limpid touch, immaculate control and expressive phrasing, his approach well matched by the beautiful sound and elegant musicianship of Mr. Kavakos." The Oregonian: "Technically, she was mesmerizing, executing all the concerto’s tricks—quicksilver runs, complex counterpoint, fast string crossings, a bit of pizzicato on the fly—with strong, lustrous tone and intonation so solid I was tempted to open the violin tuner app on my phone to have such a wonder confirmed. Equally amazing was her command of the piece in its entirety, not just having all the notes nailed down in her memory, which you could take for granted, but having a long view that turned all the seemingly disparate themes and gestures into a coherent whole." Philadelphia Inquirer: "There was the sense that the violinist was using the hall as his soundboard, and, as yards shrank to inches, that he had found a method for distilling into a sound all that is fragile in the world." The Pitch: " in his relatively brief 35-ish minutes onstage, Bell clearly demonstrated why he is considered one of the world's most deeply talented and prodigious masters of the violin." The Muskegon Chronicle : "With lightning speed, her fingers flew along the fingerboard of her instrument and her bow danced on the strings making exquisite sounds." San Francisco Chronicle: "Julia Fischer joined the orchestra for an expert yet rather cool rendition of Prokofiev's Violin Concerto No. 1. 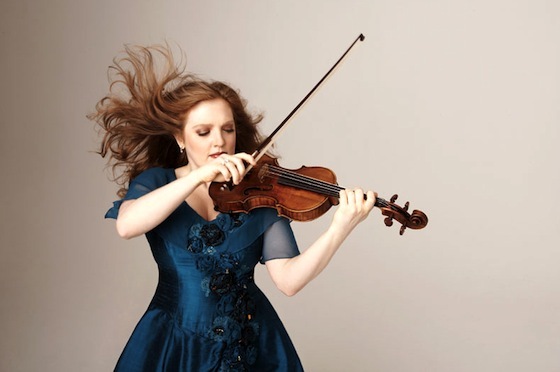 There's no denying the technical brilliance of her playing - her string tone is never less than resplendent, and her intonation and dexterity are beyond reproach." Examiner.com: "Even the tempo selections seem to be calculated to disorient the listener, only resolved when the performers gave a precise account of how the rhythms had been notated. The result was a stimulating interpretation that brought the listener to the final measure with a genuine sense of accomplishment." The Scotsman: "With a vibrato as wide as a barn door in a rather overegged first movement and a look of grim determination on her face, it was hard to account for the sparkle that suddenly emerged in her helter-skelter finale, dispatched with impeccable technical prowess." I absolutely love this week-in-reviews feature. Thanks Paul and Simon! We're enjoying putting it together, and seeing what arts journalists around the world are saying about violinists. We invite our readers to send us links throughout the week, of reviews that you'd like to see in this round-up. Also, if we missed one, please feel free to post it in the comments. I would prefer that the excerpts you choose were not only the positive comments. This gives distorted views of what was actually said. For example, the review of Julia Fischer's San Francisco concert actually was a complaint about her "joyless playing." Having gone to the concert (after looking forward to it for months), I found that assessment to be correct. As did the audience, which clapped but did not rise to its feet. A solely negative comment would also be a distortion, in fact, any one sentence from a review is not the full picture! That's why we've assembled the links; the sentences are just a way of helping people gauge whether they wish to read the full review. But thanks for the feedback, this is still a relatively new feature.